The government seems to have got further evidence connecting the banned SIMI organisation with Saudi fugitive Osama-bin-Laden following the arrest of 128 of its cadres holding a secret meeting in Surat, (Gujarat) on Friday. As war cries get shriller with traditional rivals raising the ante, an edifice of amity crumbles into history tonight when the Attari special leaves the Capital with last of passengers. The deadline for the United Liberation Front of Asom to close down its camps in Bhutan expires tomorrow as the Army braces itself to check any possible intrusion from across the border. 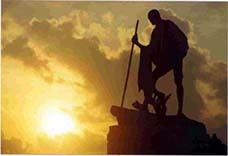 Gandhiism is perhaps the need of the new year. At least the statue of the Father of the Nation in Chennai seems to indicate that he will lead us through the tough year ahead. 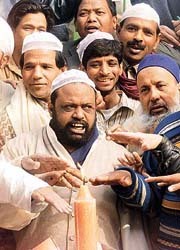 Muslim activists from the National Human Rights Council take a pledge to check terrorism and urge Pakistan to rein in radical militants at a rally in New Delhi on Sunday. DEHRA DUN: All construction on the Tehri dam must cease until the resettlement plans are implemented, according to Testimonies from the Ground. A report on Tehri Rehabilitation prepared by Preeti Sampat and Vimalbhai. The report is based on field surveys, interviews with project authorities and the affected people. Trinamool Congress leader and former Railway Minister Mamata Banerjee’s strong resistance to an increase in passenger fares and insistence on a soft Railway Budget dominated the pre-Budget exercise early this year. The government has revoked the passport of London-based influential businessman Virender Rastogi following a CBI request as the agency had filed two charge sheets against him and others in the Rs 43-crore duty drawback scam. The office of the Chief Commissioner for Persons with Disabilities has directed all state governments to ensure barrier-free access to the disabled in at least one room and toilet in over 20,000 circuit houses and travellers and inspections bungalows. Eminent historian K.N. Panikkar has alleged that the publication of the third volume of his book “Towards Freedom” has been stayed by the government due to political reasons. The three-day conference of the Indian History Congress concluded here today with an appeal to the government to stop interfering in the curricula of schools. The jail in the Bhadra tehsil of the district is overflowing with inmates and the authorities concerned are allegedly not paying any attention to the problem. The President of the UP unit of the INLD, Mr Harinder Malik, today announced the constitution of the executive of the Uttar Pradesh INLD. Border fencing work has been sanctioned by the Central government along the Indo-Bangladesh border. Locals in Jaipur sail on a patriotic high seeing soldiers move towards the frontline. Artisans and the business community in Kutch are still waiting for the government to come up with plans to resettle them. The Surat police raided the Rajshri Hall, a banquet hall, and arrested the cadres, who had assembled there from various states, including Maharashtra and Uttar Pradesh. The police seized some incriminating documents which included a pamphlet written in praise of Osama-bin-Laden. Enrolment forms of the organisation were also seized. Reports here said the SIMI cadres, after the ban on the organisation, had been operating secretly under the banner of Tahreekahya-e-Ummat, a body of ex-ansaars of SIMI. The men had gathered in Surat under the same banner and were arrested under the provisions of the Unlawful Activities Prevention Act. While the police had arrested almost 500 of cadres across the country, the prominent among those arrested on Friday were the president of the Gujarat zone of SIMI, Arif Kagzi and the former president, Mr Sohail Patel, and Rafiq Tada. All the arrested have been remanded in 14 days of police custody. Among those gathered at the meeting were 44 from Maharashtra, 25 from Gujarat, 13 from Madhya Pradesh, 11 from Karnataka, 10 from Uttar Pradesh, nine from Rajasthan and four each from West Bengal, Tamil Nadu and Bihar. Hundreds of Pakistani natives have been given preference over ‘Indian passport holders’ to board the special train to the last station this side of the border to catch the last ‘Train to Pakistan’ tomorrow morning. “During the last week of December, 2001, the services may exclusively be used for the benefit of people travelling back to their respective nations,” a Northern Railway press note said. At the last count four days ago, 608 persons had been booked for the 14-coach train up to Attari and onward to Wagah (in Pakistan) after India announced the termination of the 25-year-old Samjhauta Express from the New Year day. The deadline for the United Liberation Front of Asom (ULFA) to close down its camps in Bhutan expires tomorrow as the Army braces itself to check any possible intrusion from across the border. In the past week, more than a dozen militants were killed. All were in groups of three, signifying that terrorists have been moving down in smaller groups to evade the army dragnet, an official source said. The ULFA, until recently, had at least 36 camps in Bhutan, some of them with well-entrenched bases, complete with firing ranges and other training and recreational facilities. An estimated 2,000 cadres, led by deputy commander-in-chief Raju Baruah, head the ULFA inside the group’s bases in the kingdom. The presence of ULFA insurgents in Bhutan has topped the country’s national agenda with the National Assembly or the Bhutanese parliament discussing the issue for the past five years. Elected representatives in Bhutan have been asking the government to resolve the issue peacefully and use the military option should the rebels refuse to leave the kingdom. Meanwhile, the Army has alerted the Assam Government to the possibility of hordes of ULFA rebels sneaking into the state from Bhutan, which has asked the organisation to quit its bases in that country by tomorrow. Authorities in Bhutan yesterday said they were ‘’carefully watching’’ the pullout of armed ULFA rebels from within its territory as part of a deal made in June. “Rebels of the ULFA have already closed one camp located inside our country at Pemagashel and are in the process of winding up three more bases besides reducing the number of their cadres here,’’ Bhutan’s Home Secretary Tasho Pema Wangchuk told local newspaper ‘The Sentinel’ from capital Thimpu. With tomorrow’s deadline for the ULFA and the National Democratic Front of Bodoland (NDFB) approaching, the Royal Bhutan Army and the country’s militia units have moved into combat mode. The ULFA is said to be withdrawing following its written assurance in June given to the royal government in Thimpu that it would remove four of its nine camps in the Buddhist kingdom by December 31, 2001, and reduce the strength of its cadres. The Tehri project, one of the largest and most controversial dams in India, consisting of Tehri and Koteshwar dams, is under construction in the Ganga river basin for almost 30 years. The project is likely to affect over lakh people. According to a number of studies, including the WCD (World Commission on Dams) India Country Study, at least 75 per cent of some 40 million people displaced due to large dams in India over the past five decades have never been resettled. The experience of the World Bank and other institutions, as also reflected in the report of the WCD, show that for resettlement to succeed, certain basic requirements have to be met. Existence of a comprehensive and accurate information base regarding the number of people affected, their income structure, livelihoods and resource utilisation are the major points to be considered. A comprehensive policy should be framed taking into account all these aspects. The other considerations before the rehabilitation should be the availability of suitable land to resettle village communities as intact social entities, full participation of project affected people in planning, design and implementation of a transparent and accountable resettlement process. There should be a detailed resettlement plan, adequate budget, and time period for rehabilitation benefits with a clearly defined linkage between construction, submergence, displacement and resettlement, and an independent monitoring system. This report reveals that in the case of Tehri none of these requirements have been met. Even three decades after the project construction began, no accurate data on the number of people affected is available and no credible resettlement and rehabilitation plan exists. The 1990 estimates put the figure of displaced people at 97,000, but the recent data of Tehri Hydro Development Corporation adds up to only about 67,500 persons. A large number of affected people are obviously not even included in the R&R package. No socio-economic base studies have been done. Land is available for only a minority of PAPs (Project Affected Persons) and that land is of questionable quality or already belongs to other communities. No information, participation or accountability mechanism exists. The report further says that over 70 per cent of the rural families are yet to receive intimation about resettlement benefits. Over 90 per cent of those who are called “Partially Affected Families” are yet to be given resettlement benefits. Over 57 per cent of fully affected families are yet to be given land and the basic minimum resettlement facility. Also, the figure above do not include many other indirectly affected people. Over 93 per cent of exgratia is yet to be released. The year witnessed changes at the helm in the Railways — while Nitish Kumar assumed charge on March 21, Railway Board Chairman Ravindra Nath Malhotra took over on September 1. The Northern Railways got a new General Manager S. Dhasharathy in June end. The train accident in Kerala in June brought into sharp focus the state of the railway infrastructure, including bridges, some of which are a century-old. Over 50 persons died when the Managalore-Chennai mail fell into the Kadalundi river in Kozhikode district while crossing a bridge. In early July, Prime Minister Atal Behari Vajpayee announced a Rs 17,000 crore non-lapsable special railway fund for safety work, including track renewal, replacement of over-aged assets, strengthening of weak bridges and other works. To fulfil its obligations, the ministry announced a safety surcharge ranging from Re 1 to Rs 100 on passenger tickets from October 1. Other initiatives of the Railways that deserve mention are proposed expansion of passenger reservation facilities to make tickets available through designated internet kiosks, Green book on urgent safety-related works, resumption of the Royal Orient Express after a four-month break, announcement of greater financial powers for the zonal managers, inauguration of a railway passenger reservation centre at Leh, launch of a computerised Freight Operation System (FOIS) to enable freight customers have instant access to information on the status of their consignments, a national workshop on the recommendations of the Rakesh Mohan committee on the Railways’ re-organisation and proposed amendment of the Railway Act and the Railway Protection Force Act. Accumulation of dues by rail users has been another area of concern. As on July 31, 2001, dues of state electricity boards and power houses stood at Rs 1892 crore. At the same time, the earnings from passenger and freight traffic was below the target. In his second term as Railway Minister, Mr Nitish Kumar has paid special attention to his home state Bihar. He introduced the Shatabdi Express to cover the 500-km journey between Patna and Howrah as well as several others from Bihar and Jharkhand besides extending many existing trains. The Railway inquiry which rarely worked in Patna has undergone a sea change — it now has a 98-line railway inquiry at par with Mumbai and Kolkata. Although the Railway Minister emphatically ruled out privatisation of the Railways, the recent launch of the Millennium Express, the first private train on the track, from Tughlakabad to Chennai is being seen as the first concrete step towards privatisation. The CBI had approached the Ministry of External Affairs for revoking the travel documents of Virender Rastogi, which was finally accepted, highly placed CBI sources said here. The agency, which had announced a reward of Rs 20,000 on his head, had also secured a Red Corner Notice against Virender Rastogi from the Interpol, the sources said. Rastogi is an influential businessman in London and deals in non-ferrous metals. He is among top 20 non-resident Indians. The CBI sources said the agency would soon move the British authorities for arresting and later deporting him from that country in absence of any valid legal document. Rastogi, along with three other brothers, was alleged to have floated 15 Delhi-based export companies in collusion with certain customs officials and these companies exported bicycle parts to Russia and Hong Kong from Mumbai during 1995-96 at an exorbitant price and claimed excessive duty drawback on such exports which were estimated to be about Rs 42.94 crore, causing loss to the government. The office of the Chief Commissioner for Persons with Disabilities has directed all state governments to ensure barrier-free access to the disabled in at least one room and toilet in over 20,000 circuit houses and travellers and inspections bungalows. It has also asked the state governments to provide a barrier-free toilet for disabled in petrol pumps. The CCPD decided to take this step on the suggestion of a Pune-based activist during a recent four-day workshop on access. It has asked the state chief secretaries, disability commissioners and secretaries, Public Works Department to ensure compliance to these directions at the earliest. State Commissioners and representatives of non-government organisations endorsed this proposal at a meeting recently on strategic planning for effective implementation of the Persons with Disabilities Act. Dr Uma Tuli, Chief Commissioner for Persons with Disabilities, told TNS here that the CCPD was willing to suggest guidelines to state governments for providing barrier free access for the disabled in at least one room and toilet. “We are only asking them to convert the existing rooms into barrier-free rooms. This will not cost more than Rs 10,000 each. It will encourage the disabled to travel and also serve the needs of disabled bureaucrats who stay in these circuit houses and bungalows. Such facilities are sometimes also useful for the elderly,” she said. The volume reveals the role played by the Rashtriya Swayamsewak Sangh (RSS) and Hindu Mahasabha during 1914, a crucial year marking the beginning of First World War, he told UNI here. The three-day conference of the Indian History Congress (IHC) concluded here today with an appeal to the government to stop interfering in the curricula of schools. Another resolution before the general body appeals to the Andhra Pradesh Government to revise its decision to discontinue teaching of history in colleges as knowledge of history is necessary for a critical view of life. The third resolution appeals to the Kerala Government to restart the Kerala Historical Council closed down because of the financial crunch. The fourth resolution recommended by the executive committee to the general body calls upon the Indian Council for Historical Research (ICHR) not to delay the publication of the volumes on the history of the Freedom Struggle. The BJP youth wing activists held a protest demonstration on the first day by courting arrest. The newly elected general president of the IHC, Mr Iravatham Mahadevn, observed that the largest number of papers so far (around 350) were presented in this conference. Prof V.N. Datta was happy with the participation of young historians. The conference was hosted by the government-funded Open Bhoj University, the present vice-chancellor of which is the Commissioner of Public Relations of the MP Government, Mr L.K. Joshi. An exhibition on the life of Tipu Sultan was put up at the venue. Dr Karan Singh delivered the inaugural address. The jail was constructed about 40 years ago and with the passage of time its capacity was increased to 20 inmates. But with the number of cases pending in the courts increasing, the number of inmates has also increased. There is no barrack for women in the jail posing additional problems. Earlier there was only one first class court, but it was upgraded two years ago. For the past few years hearings are also taking place at a camp in the Additional District Judge’s court. Now a regular Additional District and Session Court has been opened at the tehsil headquarters. At present about 50 persons are lodged in the jail whose hearings are on in these two courts. Sometimes due to shortage of space these prisoners have to be shifted to Nohar, about 45 km from here. The arrangements for police officials to accompany the prisoners also have to be made. Accused from the surrounding areas of Haryana are also kept in the jail. The jail is not safe from the security angle also and there have been incidents of prisoners escaping from here. According to an INLD press release issued here today, the executive consists of two vice-presidents, one principal secretary-general, six general-secretaries, eight secretaries, seven publicity secretaries as well as other members. Mr Malik also announced the names of 22 district chiefs of the INLD for the western UP districts. Mr S.S. Puri, an IAS officer of the 1949 Punjab cadre, passed away this morning. He was 74 and one of the most distinguished bureaucrats. He served in the highest positions in India and abroad. He was the Union Agricultural Secretary and Secretary to the Planning Commission. He was also the Chief Secretary of Punjab and Ambassador of India to EEC.